This article is about the Coldplay musician. For other people with the same name, see Chris Martin (disambiguation). Christopher Anthony John Martin (born 2 March 1977) is an English singer, songwriter, musician, record producer, and philanthropist. He is the lead singer and co-founder of the rock band Coldplay. Born in Exeter in Devon, Martin went to University College London where he formed a rock band with Jonny Buckland in 1996 called Pectoralz, which was eventually renamed Coldplay in 1998. 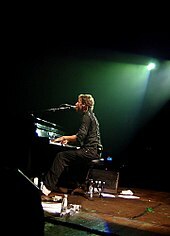 Martin, along with the other Coldplay members, achieved worldwide fame with the release of the band's single "Yellow" in 2000, a song that also earned the band their first Grammy Award nomination in the Grammy Award for Best Rock Song. The band also garnered critical acclaim and several accolades for their subsequent albums including A Rush of Blood to the Head and Viva la Vida, winning a Grammy Award for both and a Brit Award for the former. Coldplay has sold over 90 million records worldwide, making them one of the world's best-selling music artists. One of the highest profile musicians in British popular culture, Martin appeared on Debrett's 2017 list of the most influential people in the United Kingdom. Christopher Anthony John Martin was born on 2 March 1977 in Exeter, Devon, England, and is the oldest of five children. His father, Anthony John Martin, of Whitestone House, Exeter, is a retired accountant, and his mother, Alison Martin, is a music teacher. His family's caravan and motorhome sales business, Martins of Exeter, was founded by his grandfather John Besley Martin, C.B.E. (a High Sheriff- also Mayor in 1968- of Exeter), in 1929, sold by his father to a former employee in 1999. William Willett, the man who campaigned for and made daylight saving time a recognised practice, was Martin's great-great-grandfather. Martin's paternal aunt Elisabeth Jane (daughter of John Besley Martin) married Hon. Julian George Winston Sandys, son of Conservative politician Edwin Duncan Sandys, Baron Duncan-Sandys by his wife Diana Churchill, daughter of Prime Minister Winston Churchill. The Conservative politician David Martin is his father's brother. Martin was educated at the pre-preparatory Hylton School and the preparatory Exeter Cathedral School where he found his passion for music. [not in citation given] After Exeter Cathedral School, Martin boarded at Sherborne School in Dorset, where he met future Coldplay manager Phil Harvey. Martin continued his studies at University College London (UCL), staying at Ramsay Hall, where he read Ancient World Studies and graduated with first-class honours in Greek and Latin. At UCL, Martin met his future Coldplay bandmates Jonny Buckland, Guy Berryman and Will Champion. While studying at University College London, Martin met Jonny Buckland with whom he decided to form a band—Martin as lead singer and Buckland as lead guitarist. They were joined by Guy Berryman as their bass player and Will Champion, as their drummer. In 1996, they formed the rock band Coldplay, originally known as Pectoralz, later changed to Starfish temporarily until finally they were offered the name Coldplay by another band who did not want the name anymore. Since the release of their debut album Parachutes in 2000, the band has had internationally recognised fame and success. Their song Yellow from Parachutes instantly entered the charts at Number 4, the hit carried Coldplay to their aforementioned fame. To date, they have released seven studio albums in total including Parachutes, A Rush of Blood to the Head, X&Y, Viva la Vida or Death and All His Friends, Mylo Xyloto, Ghost Stories, and A Head Full of Dreams. They also released several EP's at the beginning of their creation including Safety and The Blue Room. As a solo artist, Martin has written songs for a variety of acts including Embrace ("Gravity") and Jamelia ("See It in a Boy's Eyes", co-written with Coldplay producer Rik Simpson). Martin has also collaborated with Ron Sexsmith, Faultline, the Streets, and Ian McCulloch. He also sang a part of the vocals for the Band Aid 20 single, "Do They Know It's Christmas?" at the end of 2004. In 2005, Martin collaborated with Nelly Furtado on the track "All Good Things (Come to an End)", for her 2006 album, Loose. The two were once rumoured to be a couple, after they both performed at Glastonbury in 2002. Nelly Furtado joked about it, saying, "Yeah, he's my boyfriend—he just doesn't know it yet". Martin's fascination with hip hop was shown in mid-2006 when he collaborated with rapper Jay-Z for the rapper's comeback album Kingdom Come after the two met earlier in the year. Martin put some chords together for a song known as "Beach Chair" and sent them to Jay-Z who enlisted the help of hip-hop producer Dr. Dre to mix it. Coldplay producer Rik Simpson conceived and performed the drum beats. The song was performed on 27 September 2006 by the two during Jay-Z's European tour at Royal Albert Hall. Martin has also worked on a solo collaboration with Kanye West, with whom he shared an impromptu jam session during a 2006 concert at Abbey Road Studios. He performed the chorus of "Homecoming", from Kanye West's album Graduation. In 2015, Martin collaborated with producer and DJ Avicii to work on two new tracks for his album, Stories. Their first collaboration is officially named "Heaven". Martin wrote the lyrics, Avicii did the production, and Simon Aldred of Cherry Ghost was the vocalist. He also provided the vocals for Avicii's True Believer, also in his Stories album. In September 2016, the Chainsmokers shared two short clips of an upcoming song featuring vocals from Martin. The song, "Something Just Like This", was released on 22 February 2017, and has reached number 3 peak on the US Billboard Hot 100. A song he co-wrote called "Homesick" appears on Dua Lipa's self-titled debut album, which was released in June 2017. The main influence on Martin and Coldplay is the Scottish rock band Travis, with Martin crediting the band for the creation of his own band. The Irish rock band U2 is another important influence on Martin both musically and politically. Martin wrote for Rolling Stone Magazine's "100 Greatest Artists of All Time" on the band, saying: "I don't buy weekend tickets to Ireland and hang out in front of their gates, but U2 are the only band whose entire catalogue I know by heart. The first song on The Unforgettable Fire, "A Sort of Homecoming", I know backward and forward—it's so rousing, brilliant, and beautiful. It's one of the first songs I played to my unborn baby." Martin also comments on Bono's effect on his own charity and political involvement he is even known to joke with friends referring to himself as "Crono". Martin and Coldplay were also greatly influenced by the English rock band Radiohead. Speaking to Rolling Stone Magazine, Martin said of Radiohead: "Sometimes I feel like they cleared a path with a machete, and we came afterward and put up a strip mall... I would still give my left ball to write anything as good as OK Computer." Martin is very vocal about his love for Norwegian new wave/Synthpop band a-ha. In 2005 he stated the following in an interview: "I found myself in Amsterdam the other day and I put a-ha's first record on. I just remembered how much I loved it. It's incredible songwriting. Everyone asks what inspired us, what we've been trying to steal from and what we listened to as we were growing up—the first band I ever loved was a-ha." Martin has also performed live together with Magne Furuholmen of a-ha, introducing him as "the best keyboard player in the world". In November 2011, he stated that "back when we didn't have any hits of our own we used to play a-ha songs." Martin is also known to be a fan of the English rock bands Oasis and Muse, Irish pop group Westlife, English-Irish girl group Girls Aloud, English pop group Take That, and Canadian indie rock band Arcade Fire. In 2014, Martin inducted Peter Gabriel into the Rock and Roll Hall of Fame for his solo career, and performed live with the former Genesis lead singer. Martin is also close friends with the musical couple Jay-Z and Beyoncé. Coldplay performed R.E.M. 's "Nightswimming" with Michael Stipe during their Austin City Limits performance in 2005, as a part of the Twisted Logic Tour. Martin went on to call "Nightswimming" "the greatest song ever written". He has called Richard Ashcroft, formerly of the Verve, "the best singer in the world". He also admires the lyrics of Morrissey. Martin was quoted as calling Coldplay's song "Shiver" a rip-off Jeff Buckley influenced by Buckley's song "Grace". In 2008, Coldplay released an alternate music video for Viva la Vida directed by Anton Corbijn as a tribute to the Depeche Mode's "Enjoy the Silence", one, directed by Corbijn himself in 1990. It shows Martin dressed as a king like Dave Gahan did in the original video. The band stated: "This is our attempt at a video cover version, made out of love for Depeche Mode and the genius of Anton Corbijn". Martin and Coldplay guitarist Jonny Buckland made cameo appearances in the film Shaun of the Dead as supporters of the fictional charity ZombAid, with Martin having a second cameo in the film as a Zombie. In 2006 Martin had a cameo role in the second series, episode four, of the Ricky Gervais and Stephen Merchant created comedy Extras. He also appears singing in the closing credits of the 2009 Sacha Baron Cohen film Brüno; along with Bono, Sting, Slash, Snoop Dogg, and Elton John. In March 2015, Martin attended the televised launch of music streaming service Tidal via a video link, and revealed himself, along with other notable artists, as a shareholder in the company. In June 2015, Martin performed "Til Kingdom Come" at the funeral Mass of Beau Biden, son of United States Vice-President Joe Biden, after learning that Biden was a fan of his. In August 2017, Martin performed a live solo piano rendition of "Crawling" by Linkin Park. The performance was a tribute to Linkin Park's lead singer Chester Bennington, who died by suicide the previous month. Martin has been particularly outspoken on issues of fair trade and has campaigned for Oxfam's Make Trade Fair campaign. He travelled to Ghana and Haiti to meet farmers and view the effects of unfair trade practices. When performing he usually has variations of "Make Trade Fair", "MTF" or an equal sign written on the back of his left hand and the letters "MTF" can be seen emblazoned on his piano. He was a vocal critic of US President George W. Bush and the war in Iraq. During the Teenage Cancer Trust show at London's Royal Albert Hall on 24 March 2003, he encouraged the sell-out crowd to "sing against war". He was a strong supporter of Democratic presidential nominee John Kerry, most notably during his acceptance speech for the 2004 Grammy Awards Record of the Year, accepting for "Clocks". He supported Obama for President in 2008, giving a shout-out at the end of a performance of "Yellow" on 25 October 2008 episode of Saturday Night Live. On 1 April 2006 The Guardian reported that Martin was backing the British Conservative Party leader David Cameron, and had written a new theme song for the party titled "Talk to David". This was later revealed to be an April Fool's joke. While touring Australia in March 2009, Martin and the rest of Coldplay were the opening act at the Sound Relief benefit concert at the Sydney Cricket Ground in Sydney, for the victims of bushfires and floods in Victoria and Queensland. Martin appeared in a video for the "Robin Hood Tax" campaign, which proposes a tax on stock trades in the United States. This tax is aimed at levelling the field between the so-called "1% and 99%". In June 2016, Martin supported Vote Remain in the United Kingdom European Union membership referendum. On 12 December 2012, Martin performed as a part of the "12 12 12 Concert" which was held as a fundraiser for Hurricane Sandy relief. He performed "Viva La Vida", the R.E.M. song "Losing My Religion" with former R.E.M. lead singer Michael Stipe, and "Us Against the World". Other performers in the show included Bruce Springsteen, Roger Waters, Bon Jovi, Eric Clapton, the Rolling Stones, Alicia Keys, the Who, Kanye West, Billy Joel and Paul McCartney. On 15 November 2014, Martin joined charity group Band Aid 30, performing alongside British and Irish pop acts on the latest version of the track "Do They Know It's Christmas?" at Sarm West Studios in Notting Hill, London, to raise money for the 2014 Ebola crisis in Western Africa—this was the second time Martin has contributed to a Band Aid recording having performed in the 2004 version. Martin became the creative director of the newly established Global Citizen Festival in 2015, a role he will fulfill for a period of 15 years. The festival was created in 2015 to mark the establishment of the United Nations Sustainable Development Goals (SDGs), a "to-do list" of 17 tasks to end extreme global poverty by the year 2030; with Martin consulting Band Aid founder Bob Geldof on the role. The 2015 festival, was held on Central Park's Great Lawn in New York on 26 September, and featured performances by Martin's band Coldplay, Beyoncé, Pearl Jam and Ed Sheeran, and was broadcast on NBC in the US on 27 September, and the BBC in the UK on 28 September. It was reported that Martin became the Innocence Project's Artists' Committee as an Innocence Ambassador on 5 February 2016. Martin forces himself to drink vodka with cranberry juice when he behaves "like an idiot". PETA named him the World's Sexiest Vegetarian in 2005. However, he began eating meat again after his split with Gwyneth Paltrow. Martin is a supporter of Arsenal Football Club. According to an article released by Quartz in May 2018, Martin has an estimated wealth of £94 million. Martin and American actress Gwyneth Paltrow married on 5 December 2003, in a quiet ceremony in the presence of their friends and family. Their daughter Apple was born in May 2004 in London. Martin and the band released a song "I am your baby's daddy" under the name "the Nappies" in anticipation of her birth. The band's song "Speed of Sound" was also inspired by Martin's experience and awe at becoming a father. Their second child, a son named Moses, was born in April 2006 in New York City. Moses' name was inspired by a song that Martin wrote for Paltrow. Simon Pegg and Martin's bandmate Jonny Buckland are his daughter’s godfathers, and Martin is godfather to Pegg's daughter. Martin and Paltrow announced their separation as a "conscious uncoupling" in March 2014, after ten years of marriage. Paltrow filed for divorce in April 2015. A judge finalised it on 14 July 2016. In a 2005 Rolling Stone Magazine interview, Martin, who was raised believing in a Christian God, said of his religious views: "I definitely believe in God. How can you look at anything and not be overwhelmed by the miraculousness of it?" In the same interview as well, he spoke of going through a period of spiritual confusion, stating, "I went through a weird patch, starting when I was about sixteen to twenty-two, of getting God, religion, superstition, judgement all confused". In a 2008 interview, he said, "I'm always trying to work out what 'He' or 'She' is. I don't know if it's Allah or Jesus or Mohammed or Zeus. But I'd go for Zeus." Following the interview, he announced that he was an Omnist, releasing a text message declaring himself an "all-theist", a word of his invention meaning that he believes in "everything". 2016 Super Bowl 50 Himself "Super Bowl 50 halftime show"
2017 Modern Family Himself Episode: "Brushes with Celebrity"
2002 "Where Is My Boy?" ^ "Monitor". Entertainment Weekly (1249). 8 March 2013. p. 20. ^ "Debrett's 500 List: Music". The Daily Telegraph. London. 28 March 2017. ^ "Chris Martin: The stereo MC". Independent. London, UK. 23 February 2003. Retrieved 23 February 2003. ^ a b "The Observer Profile: Jonny Buckland and Chris Martin". The Observer. London. 7 December 2003. Retrieved 4 November 2008. ^ Jonathan Dekel. "Daylight Saving Time's Coldplay connection", Canada.com; accessed 21 June 2015. ^ "X & Y = Zzzzzzzz". The Daily Telegraph. London, UK. 11 June 2005. Retrieved 22 March 2009. ^ "The State of Coldplay". Q. August 2002. ^ "Coldplay's university challenge". BBC News. 22 February 2001. Retrieved 21 February 2001. ^ "Coldplay's Official Top 20 biggest selling songs revealed!". www.officialcharts.com. Retrieved 25 February 2016. ^ "They're Friends?! 20 Celebrity Pals That Might Surprise You". Popsugar.com. Retrieved 9 September 2016. ^ "Chris Martin to release solo collaboration" NME magazine. Retrieved 26 April 2006. ^ "Avicii And Chris Martin Dance in 'Heaven' on Their New Song | SPIN". Spin. Retrieved 25 April 2016. ^ "The Chainsmokers & Chris Martin Preview New Song That'll Give You Chills". www.hollywoodlife.com. Retrieved 15 September 2016. ^ Cantor, Brian (13 April 2017). "Dua Lipa Confirms She Wrote A Song With Chris Martin". HeadlinePlanet.com. Retrieved 17 April 2017. ^ "Chris Martin | Martin: 'Travis Invented Coldplay'". Contactmusic. 20 January 2007. Retrieved 14 January 2012. ^ a b "The Immortals: The First Fifty". Rolling Stone Issue 946. Rolling Stone. Retrieved 21 December 2006. ^ "100 Greatest Artists of All Time". Rolling Stone. Retrieved 22 March 2009. ^ "Chris Martin | The Coldplay to Radiohead Connection: A Video Investigation'". Rolling Stone. 17 June 2008. Retrieved 25 April 2014. ^ "Martin: 'I'm A Big Fan Of A-Ha'". ^ "Coldplay – Hunting High and Low (Chris Martin and Mags)". youtube.com. Retrieved 20 September 2008. ^ "Vi kjente at noen av de nye låtene virkelig fant sin liveform – kultur". Dagbladet.no. 24 November 2011. Retrieved 2 January 2012. ^ "Internet Archive Wayback Machine" (PDF). Web.archive.org. 8 April 2008. Archived from the original (PDF) on 8 April 2008. Retrieved 2 January 2012. ^ "Chris Martin: I dream about Westlife". Now. 30 May 2008. Retrieved 22 October 2009. ^ Sylvia Patterson (5 October 2008). "Girls uninterrupted". The Observer. London, UK: Guardian Media Group. Retrieved 6 October 2008. ^ "Chris Martin reveals Coldplays secret love of Take That". Celebrities News. fametastic. 17 November 2008. Archived from the original on 18 February 2009. Retrieved 12 April 2008. ^ "Coldplay on Austin City Limits on Jambase". Jambase.com. Retrieved 14 January 2012. ^ "Richard Ashcroft 'Married' To Chris Martin". Gigwise. 19 March 2006. Retrieved 3 October 2013. ^ "Coldplay's Chris Martin: 'I'll never write lyrics like Jay Z or Morrissey'". nme.com. 28 April 2014. ^ a b Shaun of the Dead (2004) – Trivia, IMDb, 2008, webpage: IMDb-5748: notes role as zombie, and singer in Ash music. ^ Ben Child (1 April 2009). "Bono and Chris Martin record spoof single for Sacha Baron Cohen film". The Guardian. London, UK. Retrieved 9 July 2009. ^ "Six awkward moments at Jay Z's Tidal relaunch". BBC. 31 March 2015. Retrieved 1 April 2015. ^ Chris Martin performs at Beau Biden funeral, rollingstone.com; accessed 21 June 2015. ^ "Watch Coldplay's Chris Martin Cover Linkin Park's 'Crawling'". Rolling Stone. Retrieved 3 August 2017. ^ "Warmplay". Oxfam.org. Archived from the original on 23 October 2008. Retrieved 4 November 2008. ^ Gundersen, Edna (3 June 2005). "Catch Coldplay". USAToday.com. Retrieved 12 October 2011. ^ "Coldplay Gives Shout Out To Obama on SNL". Current.com. 26 October 2008. Archived from the original on 9 November 2009. Retrieved 25 November 2010. ^ Olaf Priol (2006). "Their wives met at yoga. Now Chris Martin plans to rock the vote for Cameron's Tories", The Guardian; retrieved 25 April 2006. ^ "Talk to David" The Guardian; retrieved 26 April 2006. ^ Mitchell, Geraldine (24 February 2009). "Coldplay, Kings of Leon to headline bushfire relief concerts". Herald Sun. The Herald and Weekly Times Ltd. Archived from the original on 27 February 2009. Retrieved 8 September 2015. ^ "Introducing the Robin Hood Tax". youtube.com. Retrieved 26 July 2012. ^ "12 Unforgettable Photos from the Epic 12-12-12 Sandy Benefit Concert", entertainment.time.com; retrieved 15 December 2012. ^ Singh, Anita (10 November 2014). "Band Aid 30: One Direction among celebrity line-up". Telegraph. London. Retrieved 11 February 2015. ^ a b "Chris Martin Talks New 15-Year Gig as Curator of Global Citizen Festival". Billboard. 20 September 2015. ^ Hampp, Andrew (9 July 2015). "Beyoncé, Coldplay, Pearl Jam to Headline New York's 2015 Global Citizen Festival". Billboard. Retrieved 5 August 2015. ^ "Innocence Project, Coldplay Team Up in Fight Against Wrongful Convictions". Retrieved 6 February 2016. ^ "Chris Martin: The stereo MC". The Independent. London, UK. 23 February 2003. Archived from the original on 10 December 2008. Retrieved 7 May 2009. ^ "Chris Martin Drinks Vodka to Remind Himself 'Not to be Such an Idiot'". Zimbio. Retrieved 30 March 2013. ^ "Chris Martin Named World's Sexiest Vegetarian," Agence France-Presse, 23 July 2005. ^ Chris Martin no longer a vegetarian post split with Paltrow, usmagazine.com; accessed 21 June 2015. ^ Brinded, Lianna; Brinded, Lianna. "Paul McCartney remains the richest person in the music industry in Britain". Quartz. Retrieved 19 December 2018. ^ Hiatt, Brian (10 December 2003). "Gwyneth Paltrow marries Chris Martin". Entertainment Weekly. Retrieved 24 March 2009. ^ Silverman, Stephen M. (14 May 2004). "It's a Girl for Gwyneth Paltrow & Hubby". People. Retrieved 3 February 2008. ^ Robertson, Jessica (10 April 2006). "Coldplay's Chris Martin Has a Boy". Rolling Stone. Retrieved 24 March 2009. ^ "Martin+Paltrow Name Pegg As Godfather". Contactmusic.com. 9 September 2007. Retrieved 17 March 2009. ^ Paltrow, Gwyneth (25 March 2014). "Conscious Uncoupling". Goop.com. Retrieved 25 March 2014. ^ "Gwyneth Paltrow files for divorce from chris martin". The Hollywood Reporter. 21 April 2015. ^ Dowd, Kathy Ehrich (15 July 2016). "Gwyneth Paltrow and Chris Martin Finalize Their Divorce More Than Two Years After Split". People. Time Inc. Retrieved 21 November 2017. The duo reached a divorce settlement in May, and their judgment was entered into a Los Angeles County courthouse on Thursday [July 14, 2016]. ^ a b Austin Scaggs (11 August 2005). "Coldplay's Quiet Storm". Rolling Stone. Retrieved 12 April 2009. ^ a b "What is Chris Martin's problem?". independent.ie. 22 June 2008. Retrieved 31 January 2011. ^ Minogue, Kylie (13 November 2015). Kylie Christmas (Liner notes). Kylie Minogue. Worldwide: Parlophone. Warner Music Group.